Kate-Lynn began her career at a mid-sized accounting firm in Vancouver, B.C., providing accounting, audit, tax and advisory services to both public and private entities. As Director of Finance of King & Bay, Kate-Lynn is responsible for financial reporting, management reporting, budgeting, treasury and tax compliance. As part of her role as King & Bay’s Director of Finance, Kate-Lynn has served as Chief Financial Officer for five different publicly-listed or private companies. She is currently CFO of Alderon Iron Ore Corp. – a development-stage, Canadian iron ore mining company and part of the King & Bay group. As Alderon’s CFO since 2015, Kate-Lynn oversees the execution of key financial milestones for the advancement of its Kami Iron Ore Project. She has acquired public practice and industry finance experience for companies that are publicly listed or quoted in Canada and the United States in various industry sectors. 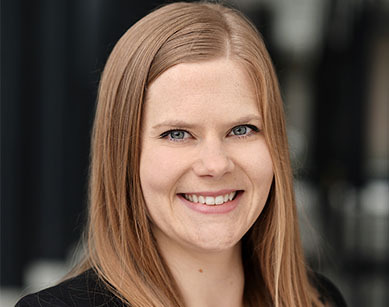 Kate-Lynn is a CPA, CA, and holds a Bachelor of Commerce (Honours) degree from the University of British Columbia’s Sauder School of Business. Q: When did you start with King & Bay and what is your role? A: I’ve been with King & Bay since 2013. I started out as a Staff Accountant and grew into my current position, Director of Finance. Q: What is an average day like for you at King & Bay? A: Everyday is different with its own rewards and challenges, but my focus is primarily on financial reporting, compliance, treasury and client services. A: You can either find me jogging outside, training for my next half marathon, or busy planning my upcoming wedding with my fiancé!.